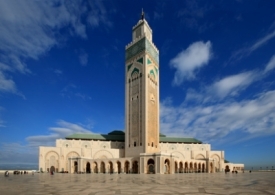 Casablanca is an interesting city, and its most popular attractions are the old medina, or Arab quarter, near the harbor and the United Nations Square with its tropical gardens and government buildings. The most popular excursion here, though, is a trip through the desert to the 11th-century city of Marrakesh. It's famous for its palaces and gardens and a fascinating marketplace where snake charmers, jugglers, acrobats, fire-eaters and fortune-tellers crowd the streets.